Paula Martinac is a nutrition educator, writer and coach. She holds a Master's of Science in Health and Nutrition Education and is Board Certified in Holistic Nutrition. Her areas of research interest include stress and weight management and women's health. Classified as a whole grain, quinoa is the seed of a plant native to the Andes region of South America, related to Swiss chard, spinach and beets. 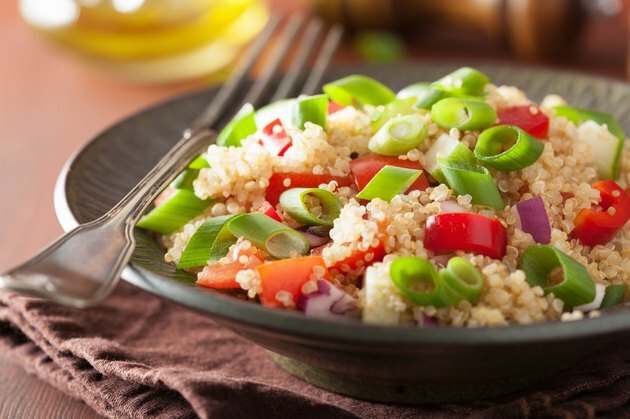 Cooked quinoa makes a nutritious, gluten-free addition to any diet, providing a valuable source of fiber and vegetarian protein as well as a variety of health benefits. If you are following a low-carb diet, however, you will need to phase this food into your regimen over time and mind your portions because it is high in carbohydrates – albeit of the healthy variety. Of the more than 120 varieties of quinoa, white or golden, red and black are most common and nutritionally similar. One-half cup of cooked quinoa contains 111 calories, 4 grams of protein, about 2 grams of fat and almost 20 grams of carbohydrates. Low-carb diets count only "net" carbs -- total grams of carbs minus grams of fiber. Because nearly 3 grams of the carbs in quinoa are from fiber, it contains 17 net grams of carbs. Unlike most plant-based foods, quinoa provides protein that's called complete because it contains all the essential amino acids. Quinoa also has a high ratio of protein to carbs. One-half cup of quinoa also supplies a variety of other nutrients, including B vitamins and vitamin E, and minerals such as iron. You’ll get 17 percent of a man’s daily iron requirement in a half cup and almost 8 percent of a woman’s. Because quinoa is high in carbs, it may not fit into some low-carb diets -- at least, not right away. These diets include from 30 to 130 grams of carbs a day, according to the National Center on Health, Physical Activity and Disability, while very-low-carb diets limit you to 20 to 50 grams of carbs daily. The two-week induction phase of the Atkins diet -- possibly the most well-known low-carb diet -- is considered very low carb, as is the second phase. Phase One includes only 20 to 25 grams of nonstarchy or “foundation” vegetables, especially green ones, and you can have 25 to 50 grams in Phase Two; in both cases, quinoa and other grains are strictly off-limits. In later phases of Atkins -- when the carb allowance increases to 50 to 80 net grams and 80 to 100 net grams -- you can add moderate servings of whole grains back into your regimen. According to the Atkins carb counter, a serving of quinoa is one-quarter cup, which provides just under 9 grams of net carbs. Quinoa is widely hailed as a super food with numerous health benefits, so include it in your low-carb regimen whenever possible. Its fiber and protein help keep you satiated, an important factor for weight management, while its iron content helps transport oxygen to the body’s tissues. As a gluten-free grain, quinoa boosts the fiber content of diets for people with celiac disease or gluten intolerance; the protein gluten, found in wheat and other grains, can cause serious digestive problems in these people. Quinoa is also high in antioxidants, particularly quercetin, according to a study published in the Journal of Medicinal Food in 2009; antioxidants protect you from free radicals, unstable compounds that can raise your risk of cancer and other problems. Quinoa also shows promise in the management of complications of type 2 diabetes. Further, the fatty acids in it may protect you from cardiovascular disease. Quinoa has a mild, slightly nutty taste and easily soaks up other flavors, like lemon, spices and olive oil. Rinse quinoa in water before cooking, to remove residual saponins – a natural but bitter coating that keeps insects away while the plant is growing. It cooks quickly, in just 10 to 15 minutes. You can enjoy quinoa hot or cold, as a side dish for your fish or chicken, or as a salad with fruits, nuts and veggies. Use it as a protein-rich alternative to rice in your recipes or as a gluten-free substitute for couscous in Middle Eastern dishes like tabbouleh. You can even try making a quinoa porridge for breakfast or incorporating quinoa flour into gluten-free baked goods. The Kitchn: What’s the Difference Between Red and White Quinoa?